OKLAHOMA CITY – Actions taken by the Oklahoma Medical Licensure and Supervision Board against a Tulsa spine surgeon warrants a criminal investigation, an Oklahoma City defense lawyer said. Without speaking about specific individuals, attorney David Slane said board members and agency staff members likely violated a number of laws that could result in felony and misdemeanor charges. “I’ve been a criminal defense lawyer for more than 20 years and I can tell you this situation certainly needs to be investigated,” he said. Spine surgeon Steven Anagnost was targeted for prosecution by the medical board, competing Tulsa surgeons and a group of medical malpractice attorneys after he refused to join the Oklahoma Spine and Brain Institute (OSBI) in 2005. From that time until 2008, Anagnost contends his competitors began compiling a list of complaints against him, many of which resulted in lawsuits filed from 2008 to 2010. In most of the cases, the complaints were initiated by the surgeons at OSBI, Anagnost claims. Anagnost, a pioneer in Oklahoma with Minimally Invasive Spine Surgery (MISS), was performing about 40 percent of all spine surgeries in Tulsa, leaving competitors jealous and outraged. An independent review of Anagnost’s case left Slane with the impression that as many as four felonies may have been committed, including conspiracy, offering fraudulent or forged evidence, perjury and violation of the Oklahoma Computer Crimes Act. In addition, Slane believes a handful of misdemeanors, including possible violations of the Open Meetings Act and the Open Records Act, should be investigated. Other options include a grand jury investigation or a probe by a legislative oversight committee, Slane said. Part of the alleged conspiracy by the “Unholy Trinity,” – the competing physicians, medical board and the medical malpractice attorneys – occurred in January 2010 when the agency’s staff members held a secret meeting at the Southern Hills Marriott in Tulsa to interview competing spine surgeons about patients who had previously been under Anagnost’s care, according to documents obtained by Red Dirt Report. Internal emails and memos from the state medical board illustrate the agency’s desire to revoke Anagnost’s medical license. However, that never happened and he was never disciplined in connection with any of the complaints filed against him. The alleged conspiracy continued into the following year when medical board investigator Gayla Janke wrote an email to Dr. Frank Tomacek, one of Anagnost’s competing surgeons, urging him to round up as many cases as possible against Anagnost. The email was dated Oct. 28, 2011. A conspiracy conviction carries a maximum prison sentence of 10 years and fines up to $5,000. 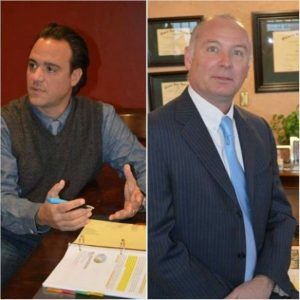 The Sneed Lang firm and two other attorneys – Gary Brooks and Randy Sullivan – filed the majority of lawsuits against Anagnost. Brooks was a medical board member at the time he filed two lawsuits against Anagnost in 2010. Sullivan, a medical board prosecutor in the Anagnost case, also filed two cases against the surgeon that same year. Slane contends the volume of allegations made against the medical board and its staff should be looked into as soon as possible. Oklahoma County District Attorney David Prater did not return a phone call for comment. Will Gattenby, press secretary for Oklahoma Attorney General Scott Pruitt, offered no comment on the case or if Pruitt would consider opening an investigation into the allegations. Pruitt hasn’t always been quiet in connection with the state medical board. In 2003, then-state Senator Pruitt was critical of Brooks’ appointment to the board. “The appointment of Gary Brooks or, for that matter, any trial lawyer who makes his living suing doctors, to the medical licensure board creates an outrageous, unacceptable conflict of interest,” he said at the time. Slane referenced a separate allegation that Dan Graves, the medical board’s special prosecutor, deliberately changed a CT scan exhibit that was presented during Anagnost’s deposition on May 15, 2013. Anagnost said the scan was different from the exhibit given to him and his attorneys prior to the deposition. According to Anagnost, the altered images hide the screw tracts that were actually in the bone. Anagnost acknowledged the screws pulled out but that was due to the elderly patient’s soft bone. When the surgeon objected to the CT scan in question, he was castigated by Graves, according to a deposition transcript. “This exemplifies destruction of public records, destruction of evidence and filing a false or forged instrument,” Anagnost said. According to state law, presenting forged or fraudulently altered evidence in any trial or proceeding is considered a felony. Anagnost contends medical board Executive Director Lyle Kelsey lied to the Senate Health and Human Services Committee last year when he testified board members had no knowledge of the Anagnost investigation. However, several emails demonstrate Brooks, then a board member, met with investigators in 2010 about medical records, deposition transcripts and other medical evidence. Brooks left the board in July 2011. Anagnost alleges state computers were used in the agency’s conspiracy to take away his medical license. The emails and memos obtained by Red Dirt Report show the correspondence was written on agency computers and was sent during regular business hours. Violation of the Oklahoma Computer Crimes Act carries a 10 year prison term and fines ranging from $5,000 to $100,000.